The main Tourist Information Office in Arles is located in a modern building on the Boulevard des Lices. It is in easy walking distance to the principal monuments of Arles. There is also a small office in the Arles train station. Maps, information on walking tours, and other brochures are available to help guide your visits in Arles and the nearby Camargue. There are also a variety of combination tickets, so if you plan to visit several monuments in Arles you will want to take advantage of one of these "passeports." 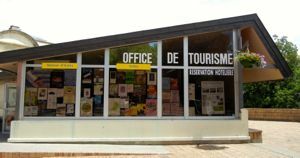 Tourist Information Office, Arles, France.